Home » Aeroplane vs. Airplane – What’s the Difference? Some people ride airplanes, while other people ride aeroplanes. In some cases, one person might be riding an airplane, while the person in the adjacent seat is riding an aeroplane. It seems hard to believe, but due to spelling differences in regional English, two people sitting next to each other in the same vehicle might use a different word to describe that vehicle. But which version should you use? If both words can describe the same aircraft at the same time, it might not seem to matter. Continue reading to learn more. What is the Difference Between Aeroplane and Airplane? In this post, I will address the airplane or aeroplane dilemma. I will use each spelling in at least one example sentence, so you can see how it appears in context. Plus, I will show you a memory tool that will make it easier to remember airplane vs. aeroplane in your writing. How to spell airplane: An airplane is a flying vehicle. At any given point, there are thousands of airplanes in the sky at once. Some of these vehicles transport cargo, and others are passenger airplanes. The word airplane is sometimes shortened to simply plane. Aircraft is a synonym, which functions as both a singular or plural noun. Here are a few examples of airplane in a sentence. When you ride in a commercial airplane, you will likely only be able to bring one or two small bags on board with you. If you know someone who owns an airplane, you can ask them politely if they will take you for a ride. Air travel has become a part of daily life for many English speakers. Most people who do not travel via airplane regularly or at all know someone who has used this mode of transportation. How to spell aeroplane: Aeroplane is an alternative spelling of the same word. Specifically, it is the way British English users would spell it. You can substitute airplane for aeroplane in the sentences above without changing the meaning. The graphs below show the relative usage of aeroplane vs. airplane in both varieties of English. These charts aren’t scientific, since they only look at words used in books published in English since 1800. Still, they clearly illustrate a long-term trend in usage. Airplane is clearly the preferred spelling in American English, whereas there is a slight preference for aeroplane in British English. Airplane and aeroplane are the same noun, spelled two different ways. American writers tend to prefer airplane, while their British counterparts prefer aeroplane, at least for now. Since aeroplane contains the letter E, like England, it should be easy to remember that writers from England will probably spell the word as aeroplane. Is it aeroplane or airplane? 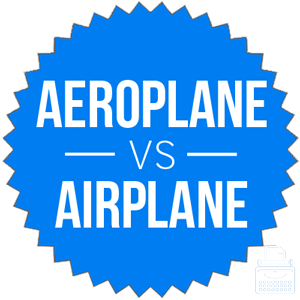 Aeroplane and airplane are two ways to spell a singular noun that means a flying vehicle with wings and an engine. Aeroplane is the British spelling. In all senses, they have the same meaning and can be substituted for each other. What separates the spellings is the language community that uses each. 1 What is the Difference Between Aeroplane and Airplane?